The four crew of the ARC yacht Magritte have been evacuated after their cruiser began taking on water. 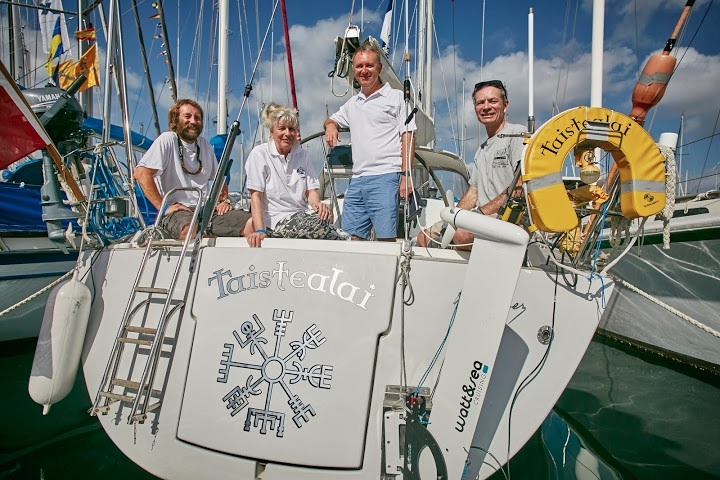 At 1940 (UTC) last Thursday, 3 December, World Cruising Club was contacted by Steve Arnold, skipper Magritte to advise them that the yacht was taking on water. The source of the ingress could not be identified or stemmed and the four crew on board indicated that assistance was required as the situation worsened. On the advice of MRCC Falmouth, a Mayday was issued and the yacht’s EPIRB activated. The liferaft was readied in anticipation of a possible need to abandon the yacht. Magritte’s a Moody Grenadier 134, British flagged, owned by Steve and Teresa Arnold. MRCC Cape Verde co-ordinated the evacuation of the four British crew. Cargo vessel SCL Basilea diverted to provide assistance, reaching Magritte at approximately 0500 (UTC). The crew were safely evacuated and are all well on board SCL Basilea which is now en route to Spain. Magritte was abandoned at approximate position 16 44.36N 027 27.82W. The cargo ship with its rescued yacht crew are expected to arrive in Spain this Saturday, 12 December. After delayed departures, the Beneteau 44 Oberon, Hanse 505 Hanse Sailor (which required a new boom) and British Beneteau First yacht Southern Child (which diverted to Tenerife for boom repairs) are catching up the rest of the ARC fleet en route to Rodney Bay, St Lucia. Since the first ARC+ boats made landfall 11 days ago, the once-quiet dockside in Rodney Bay has been transformed into the venue for a mobile party, as each new arrival is greeted to cheers, waves from friends, and of course ice-cold Saint Lucian rum punch. The Crew of Timshel shared their details of their dawn arrival – 15 days after leaving Mindelo, Cape Verde: ‘It was a relief to see the lights of St Lucia appear ahead – after so many days of seeing nothing you do wonder … In a way we were sorry to have to stop, however we gybed round the north of the island and in to Rodney Bay. The folk on the guard boat where really helpful, and we crossed at 10.07.46 UTC according to my watch, which was just about dawn local time. ‘At least there was some light for the photographer buzzing around in the RIB, and we could see to drive through the channel into the lagoon. Mojeka who was driving out gave us a cheer and the crew of Arriba who seemed to be up early gave us a great welcome. I chose to hoist the flags before doing the ropes and fenders, but it was great to have Manuel with yellow shirt there to greet us and take the lines for us. We enjoyed the rum punch welcome on the pontoon, the St Lucia tourist board guy even gave us a certificate as well as the basket of fruit (and more rum). And speaking of parties – there have been plenty so far for arriving crews to join in! On Friday night, crews could join the Friday “Lucian Lime” in the Boatyard and headed for a culinary treat on board The Pearl Pirate Ship or dance the night away at the Gros Islet Isle Street Party – a fun local Jump Up with plenty of Caribbean entertainment. Saturday saw the last ARC+ boat, Odyssey, arrive in Rodney Bay. They had a later start from Mindelo waiting for a crew member to join the boat. Away from the marina, ARC+ crews contributed to Saint Lucia’s Rainforest with a tree planting excursion to the south of the island and live music at the Boardwalk rounded off the evening. The Saint Lucia Tourist Board hosted a welcome cocktail party on Sunday, an official welcome for the hundreds of ARC+ sailors. The Green in the heart of the marina soon filled with crews enjoying the steel pan band, drinks and nibbles. Paul Ash, Manager of IGY Rodney Bay Marina and John Emmanuel, PR Manager for the Saint Lucia Tourist Board greeted participants with brief speeches, and World Cruising Club’s Andrew Bishop invited Pekka Karlsson and his wife Barbro from Corona AQ on stage to recognise the very special achievement of sailing with the first ARC in 1986 and with the 30th edition this year. A roar of applause from the audience was a fitting tribute to them and their 50-year-old boat. On Wednesday, the achievements of many more ARC+ crews will be celebrated with the official prize giving ceremony – with awards for sailing performance and a host of fun prizes being presented. Meanwhile for the ARC fleet still at sea, temperatures are beginning to soar and skins are slowly turning brown in preparation for the Caribbean. “Another fine sunrise in paradise, revealing a beautiful blue sky, and already warm at 0830 so going to be hot, hot, hot!” writes the crew of Challenger 3 in their log. On the whole, their first two weeks at sea have delivered text-book tradewind sailing with winds of around 20kts blowing along the rhumb line. Whilst this means steady progress towards Saint Lucia shores, life on board is anything but steady. Rest, relaxation and rum will greet the ARC crews once the final few hundred miles pass under the keel and it’s a bitter-sweet feeling on board as crews begin to reflect. “Sitting on Northern Child this Sunday the 6th at noon with only 500 nm to go, you are filled with mixed feelings. On one hand you feel happy to realize that you actually have a good chance to reach St Lucia safely within a few days time. On the other hand you feel sorry because that means the end of this fantastic adventure.” writes Lars from Denmark. Friends and families can follow the fleet and see individual boat’s estimated arrival time via the online Fleet Viewer or YB races app on a smartphone or tablet.